Come on Zavvi, correct the pricing now!! Not liking this half a product Steelbook new trend. I enjoy watching the films in 3D and this justifies the pre order outlay. £25 for 3D/2D Steelbook was bearable. £25 for a single disc is not. The 4k cost is too high currently. Should be £25 for 4k/2D disc. Until that happens, or price cuts occur, I am out of buying on release. Gutted as I guess the Marvel films will drop to one disc going forward. That makes my collection incomplete. LMAO, you just know now this will be basically a blank front with an umberella or something rubbish on the front. P.S. Lets see how Disney are going to come up with something that will impress us as it certainly won't be this. no not bothered at that price at all. something tells me there goona be hanging on to this for a while. personally if everyone on here boycotted this steel wouldn't that send a nice message back! Watched this last night in the IMAX and it was an enjoyable family film. On the 4K wagon now at home. £32.99 is too high a price for a 4k Disney steel. I will wait for this to drop in price I feel. Not all people - I won't pay these prices and I don't care what the film is like (refused to buy any 4K only HMV steelbook at £30). I also won't buy a non 3D version of a film that received a 3D theatrical release. Am I bothered about missing out on this (or any other) steel; nope, not at all - rather spend my money elsewhere. 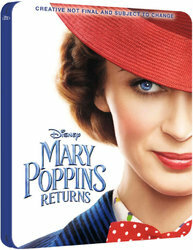 I’m going to buy it, regardless the price, because it’s Emily Blunt! Not too fussed about this film anyway, but wouldn't mind at least giving it a go... certainly not at those prices though! Disney thought just slapping a Star Wars logo on something made instant cash. In an era of streaming and downloading, the buying of specialist physical media is not the biggest market. From a personal point of view I set a price limit on each release and abide by it. The lack of a 3D disc but for the same financial outlay is a huge NO. agreed - £24.99 for 2D only is a joke. I am now the only one in the family that watches discs.